Whether you're looking to decorate your storefront or hotel entrance or make your outdoor dining area fun and festive for the holidays, adding Outdoor Artificial Plants is a tried-and-true way to dress up your establishment in style. Our seasonal faux plants collection has everything you need to add just the right touch to your building's exteriors and surrounding property. From artificial poinsettias to faux boxwood hedges with lights, we have you covered. Have a special event coming up? Use window boxes with plants that are delivered ready to use that require no maintenance and can be used for many seasons to come. Of course, all of our outdoor rated plants are made to withstand year-round weather and feature inherent UV protection. At Artificial Plants Unlimited we really mean what we say - Unlimited Plants! We can make anything you need to decorate your business for the holiday season. Combine any of your favorite foliage - from evergreens and bamboo to Japanese boxwood and English ivy. Decorative soil and moss toppers can be included for more realism, and we can illuminate nearly any display. Pair our plants with flower boxes, planters or hanging baskets for the best holiday plants and displays tailored for you. Outdoor Artificial Holiday Plants dress up the season easily, conveniently, and colorfully, adding festive winter decorations without the maintenance that live plants require. Outdoor artificial plants increase seasonal curb appeal to your home or office with several decorative container designs available, including options for a window box, terracotta pot, or a hanging planter like those you would see in an English garden. Each holiday faux plants style is delivered ready to use, completely populated so all you have to do is place wherever you would like to add some color and holiday cheer. Perfect for holiday parties or dressing up your business entryway, outdoor artificial plants are perfect for special events too. Decorate using potted poinsettias to line your building entrance, or use as raffle prizes or giveaways at the end of your holiday soiree. No matter how you decorate or use as gifts, these colorful faux plants are sure to add plenty of good wishes and merriment. What's more, they last year after year since they are made with high quality materials designed to last and last. As mentioned above, we offer several planter options to choose from, each serving a distinctive kind of use or placement. Our Poinsettia Mounted in Terracotta Pot is ideal for decorating table tops at the holiday dinner you'll be hosting. These faux plants are also very stylish when multiple pots line walkways or are strategically placed in entryways to homes or commercial buildings. If you have a number of smaller surfaces, the Terracotta pot is perfect for numerous locations inside or out. 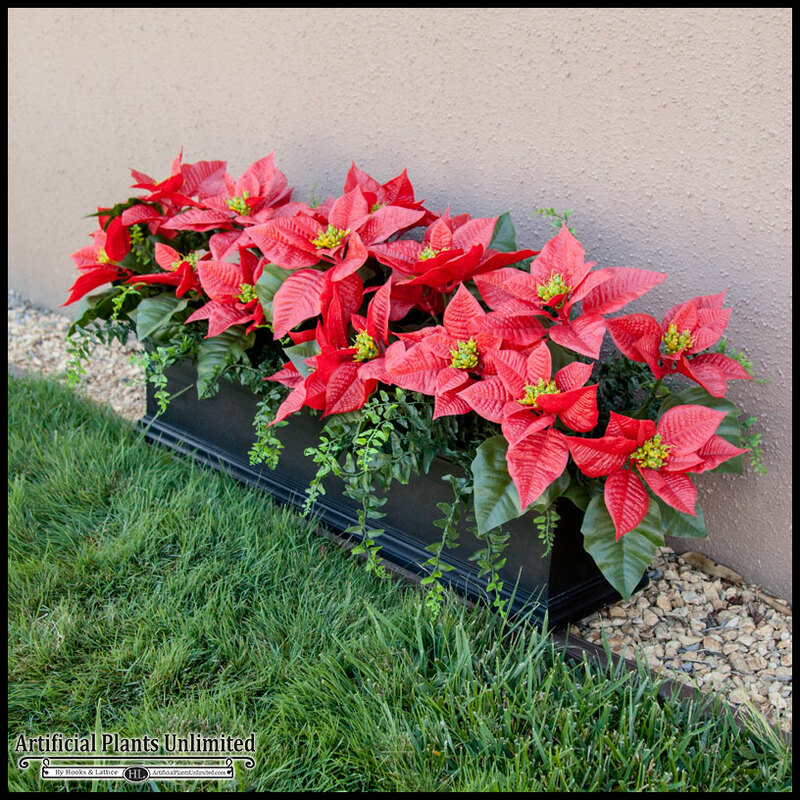 The Poinsettia and Buckler Fern mounted in Black Laguna Fiberglass Window Box is picturesque on longer surfaces, at the end of benches, even mounted just for the season beneath the windows of your home's exterior. Faux planters are UV protected, preventing the colorful leaves from fading in the sun or become damaged during periods of inclement weather. Our Poinsettia Mounted in Hanging English Basket adds holiday cheer to awnings, deck railings, or hung from a simple hook, even civic lamp posts and poles. Looking lush and full, these colorful beauties rest in a coconut liner, complete with soil topper to create a truly authentic look to any ambiance. For additional information about our outdoor artificial holiday plants, or to inquire about fake evergreens and decorative English ivy, please contact our expert design staff today.